Image © DC Entertainment. Written by Robert Venditti, art by Rafa Sandoval and Jordi Tarragona, colors by Tomeu Morey, letters by Dave Sharpe. Not for the first time, Jack Kirby’s New Gods are crossing over with the GL Corps in this book. Only this book so far, and as the New Gods do not have their own title, the entire story is here (I think), so I’m okay with that. But is it a good read? Hal and Kyle are trying to save Orion of the New Gods from the attack of some giant robots programmed eons ago by the head of the OLD gods, Yuga Khan, the father of Highfather, and therefore the grandfather of Orion. Yuga Khan feared he would be overthrown by his own progeny, and so it happened. He’s now entombed in the Source Wall. These robots have suddenly come back to life with the mission of destroying all the New Gods. Interesting back story, that. These giant robots are formidable, and the only way they might be stopped is to convince them that Orion is dead. 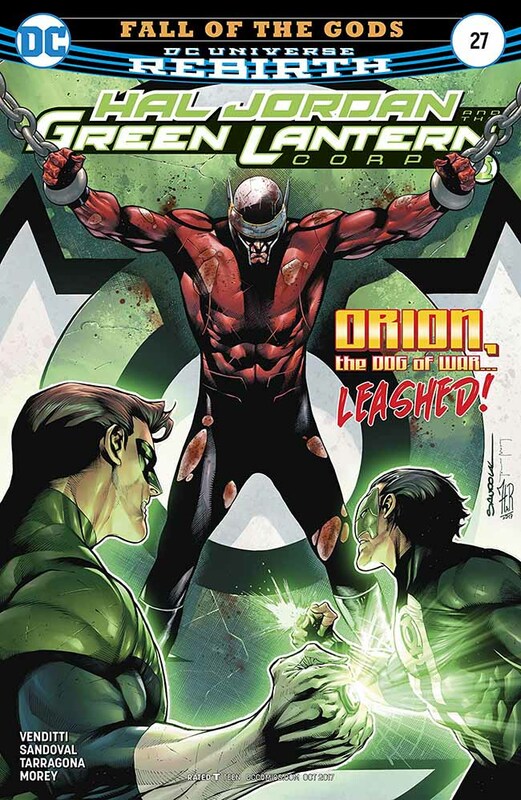 The only way Hal and company can do that is to kill Orion. Interesting, gruesome and complicated developments ensue! Orion does not read particularly like the Kirby version, but I still enjoyed this. Recommended. This entry was posted in Comics, Reviews on March 1, 2018 by Todd.